Cal Fraser looks at the problems and risks presented with an ever-more belligerent North Korea, a cautious China and new political administrations in South Korea and the United States. Cal Fraser looks at an increasingly authoritarian and bolstered President Erdogan thanks to last month’s constitutional referendum, and the future of relations between Turkey and the Western world. 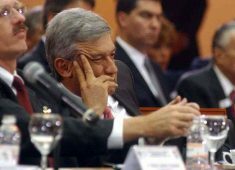 Mexico’s López Obrador — the only politician who can stand up to Trump?